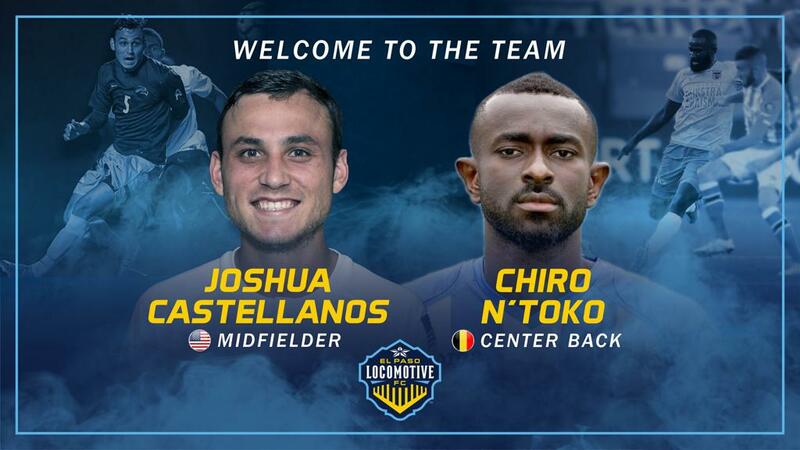 El Paso Locomotive FC has signed Joshua Castellanos (United States) and Chiro N’toko (Belgium). EL PASO – November 14, 2018 – El Paso Locomotive FC has signed Joshua Castellanos (United States) and Chiro N’toko (Belgium). Castellanos will find his place in the midfield and comes to El Paso from Jacksonville Armada, the former Club of El Paso Locomotive FC Head Coach, Mark Lowry and forward, Derek Gebhard who was signed earlier this year. In the 2018 season, Castellanos saw ten starts in 12 games played and netted four goals and one assist. Chiro N’toko, center back, has spent the majority of his professional career in the Eerste Divisie and the Eredivisie which is the highest level of professional soccer in the Netherlands. N’toko will be an integral component of the defense and is coming from the Fortuna Liga in Slovakia, where he played with FK Senica. With these two signings, El Paso Locomotive FC’s roster is officially five players signed with more announcements to come. With over ten years of professional experience playing in Europe, N’toko brings with him invaluable experience and knowledge of the game. “When building a winning team, I believe the center backs are a critical piece, and no stone was left unturned in our pursuit to bring the right one to this Club. In Chiro, we have a center back who is comfortable building our possession from the back and is aggressive and athletic enough to defend in the manner with which we plan to play this season. His experience and character are second to none. Playing at the highest levels in Holland he has been drilled on playing out from the back; he is a born winner and will be a great leader for us on and off the field,” said Mark Lowry.